RVers with pets are always thinking about the safety and comfort of their pets. While I love taking my dogs along, sometimes it’s just better that they stay home in the RV. So having good preparation before you leave will make for a pleasant time away from your pets. Boondocking or “dry camping” is camping without any hookups, so no electricity. Many full time RVers have Solar, but even with that, most cannot run an air conditioner with their solar set up. 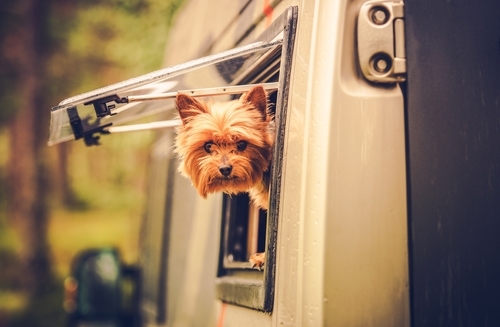 The concerns of RVers leaving their pets in their RV is a big one. It’s definitely one that comes up a lot on groups and forums and has been one that I have set up protocols for my RV and dogs. 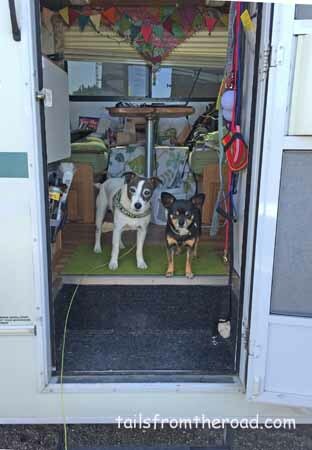 If it’s hot, really hot and your RV will heat up, you cannot leave your pets when dry camping. So this involves watching the weather closely, I recommend using a weather app like Wunderground that you can check the weather hour by hour for a particular area. You’ll need to find a RV hook up or hang out with your pet. The area is not safe enough to leave windows cracked open. I would not leave my windows shut up unless it was below 60°. It is very cold outside and therefore you will need to run a heater. I would not suggest leaving pets inside an RV with the propane heater on. Even if you are plugged in with the A/C running, in HOT weather, I would follow the steps below if you are gone all day, in case your A/C turns off. Take your dogs out for a really good walk, make sure they have pottied and exercised enough for their needs. Close all window blinds. This is if your dog is aroused by outside animals, people or noise. If you dog is quiet and enjoys looking out, by all means leave a place for him/her to do so. Put up a block out screen on the front windows/windshield, as this is the place where the most heat can come in and build up. Crack 1-3 windows about 2-3 inch and turn on your ceiling fan. I suggest having a Fantastic Fan or one like it installed in one of your vents. Turn on to the exhaust setting. These fans work so well in bring air throughout the RV and they run off of your house batteries. The fan draws air from the open windows throughout the RV and out the fan vent. It’s an amazing breeze! If you are going to be gone for a full day, I would only do this if you have a neighbor close by that will be able to let your dogs out or at least know that they are in the RV alone. Meet your neighbors in the days, or day before your departure. 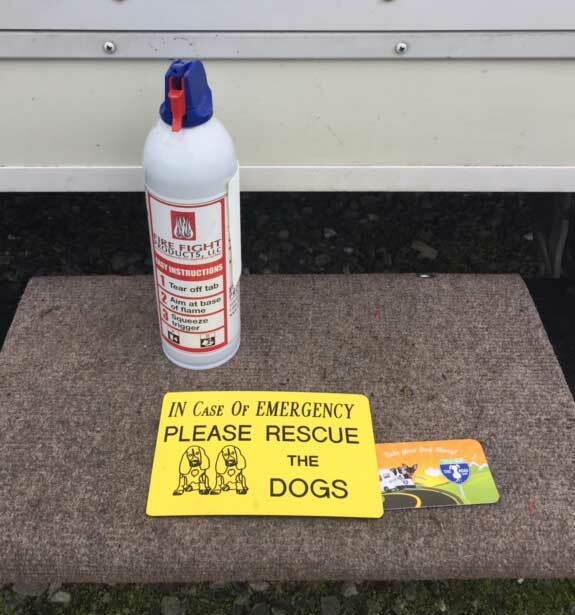 Find one that you are comfortable with to leave keys to your RV to either let your dogs out or keep in case of emergency. You can also just give them a door key. Let them know any quirks about your dogs and give them a protocol of what to do and NOT to do. Exchange phone numbers. Having a neighbor involved is key if you are gone for several hours, you could get stuck in traffic or get held up for any number of reasons. Put a sign on your dog step that says there are pets inside. Here’s my set up on my step to my door on my RV. Put your phone number or a business card by the sign, so someone can call you in case of emergency. Put a fire extinguisher outside by the door. If your RV catches on fire, someone can grab it and try to extinguish the fire. The link is for Mac the Fire Guy’s fire extinguishers which I have three in my RV, one by my bed, one on the counter of the kitchen and one in the driver’s side door. Turn off your refrigerator! If you have a propane refrigerator, turn it off, it will be fine for 8-10 hours. Since it won’t be opened, (you didn’t teach your dog to open the fridge, did you? ), it will stay cold enough. Many fires in RVs are started from the refrigerator. This is best and more important tip I can give you! If you have a generator, you could leave it running with the A/C running, but this would be a short term option, for a grocery store run. There are too many things that can go wrong with this scenario. I did find a device that connects to your Verizon Smart Phone and gives you data of high and low temperatures that you set. It sends alerts to your phone when the temps hit these temps. The RV PetSafety by Nimble also tracks the GPS of the RV. The device is $179 and has a $14.99 per month subscription. I have not tested this product. I have searched extensively for other products that would work easily in an RV and found many for homes and others that use WI-FI, which I would not recommend for an RV. Look for an update soon regarding this monitor and possibly others. I’m going to let some cat experts give you some good advice. Chris & Cherie from Technomadia are the best resource for getting information regarding staying connected with phones and WI-FI and all the equipment needed to do that. They also are great cat owners/travelers, so here’s a great video talking about cat travel. So you’ve exercised your dogs, they have pottied, you have closed window blinds, open some windows, the fan is on exhaust (if needed), neighbors have been notified, phone numbers exchanged, signs put out, fire extinguishers are out. Now go out and have fun! You are so amazingly organized! I love that about you! Your dogs are in the best of hands.